This is a (partly shortened) version of an article I wrote recently in Spanish language for Ama Ata. For reasons of the variegated methodology used by the various researchers this comparison across time and space has to be simplified. Still it is a valuable insight on the demographic changes produced in the Neolithic and later on in three European regions: Germany, Portugal and the Basque Country. 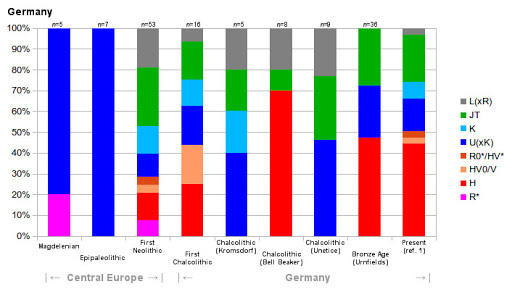 The first period when we see an mtDNA pool similar to the modern one is already in the Late Bronze Age. However we lack data for all the early and middle Bronze Age and the data of the late Chalcolithic already points to the components of this modern pool being present, albeit in a very fragmented form. If anything there was still excess of L(xR), i.e. N(xR). This late Chalcolithic and Bronze Age knot of Central European demographic history is still to be solved. But something we can already say for sure: the Neolithic wave was of dramatic consequences in this region but itself was wiped out by later, still ill understood, secondary waves. One of the problems here is, quite evidently, that sequencing only the HVS-I region is not at all enough to identify some very important haplogroups, particularly H. We can reasonably think however that most or even all of the R* sequences are actually H.
We see some but not-so-radical changes with the arrival of Neolithic: some apparent decrease of U (halved) and L(xR), a +33% growth of H and first detection of HV0 (probably V). However these changes seem to have been partly countered by Chalcolithic, plausibly by means of blending between first farmers and more purely aboriginal populations. Overall I am very much tempted to think that the arrival of Neolithic to (South and Central) Portugal only caused mild demic changes. This fact, together with the extremely high frequencies of haplogroup H and the key role played by SW Iberia in the formation of Dolmenic Megalithism, as well as their pivotal role in Bell Beaker, including the existence of a major civilization (Zambujal, VNSP), the first one ever in Atlantic Europe, makes this area highly suspect as a possible origin for the spread of mtDNA H in Western Europe to the frequencies that we find today (c. 40-50%). However we have only very limited archaeogenetic data from other Atlantic Megalithic regions and in general from Megalithic burials and it is at least possible that Armorica (Brittany, West France) or Denmark and the nearby Low Germany regions played important roles in this spread, which we see so dramatically exemplified in the German Bell Beaker sample. When the finger points to the Moon, the fool looks at the finger. Portugal could be the Moon but it may just be the finger, so I will remain cautious at this stage of research. Whatever the case it does seem to me that Megalithism is a likely source of that excess H (Bell Beaker being just the finger here, almost for sure). I must add that there seem to be some important demic changes since Chalcolithic in Portugal. Tentatively I will attribute them to the intrusive SW Iberian “horizons” (proto-Tartessian?) and/or the Luso-Celtic invasions of the Iron Age. My main aim in all this compilation was, as in a sense in all my diving into prehistoric research for so many years now, to find an answer to the mystery of the origin of Basques and Basque language. Very synthetically, I think that we can see here, much as in Portugal, some not too radical changes with the Neolithic arrival, and then relative stability until present day. This is coherent with the Basque Country not having suffered effective Indoeuropean invasions, unlike Portugal. Seen as that, it would seem like the Neolithic-induced demic change was more important in Navarre and less in the Western Basque Country. However the two Ebro basin sequences (both Fuente Hoz and Los Cascajos) are very high in U* and low in U5, which is so far the only U subclade sequenced in the Paleolithic of the Basque-Cantabrian area. At this point I do not really know how to interpret this fact nor even what kind of U sublineage is that one. What I do know is that, on one side, the Biscay-Gipuzkoan area seems to have been initially unaffected by Neolithic demic waves and that the Paternabidea sequence is very very similar to modern day Basque average (and even more in its own sub-region). It is very possible that the Basque periphery, notably the Ebro banks, suffered more intense demic changes than the core Basque areas of the piedmont. However, when compared with other European regions (very especially Central Europe) the Basque genetic pool seems quite stable since Neolithic times. Even if genetics and language need not to be tightly related, of course, the question of the origin of Basque language and the proposed Vasconic language family, believed to have been spoken in much of Europe at some point in Prehistory, are indeed related to the genetic origin of the Basque people. 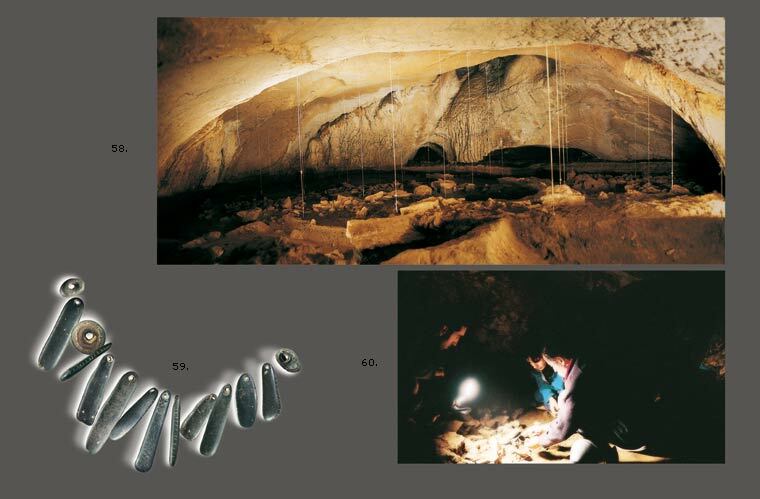 Magdalenian (Paleolithic) origin in the Franco-Cantabrian region some 17-15,000 years ago (incl. possible sub-waves like Tardenoisian/geometric Epipaleolithic). More or less recent (Iron Age?) arrival, defended by mostly by the fanatics of Indoeuropean continuity. We can safely discard #4 only based on archaeology but the genetic aspect seems to add even more weight to this dismissal, after all it is Indoeuropean speaking peoples the ones which show obvious signs of demic change, sometimes very dramatic, not Basques. Personally, and with due caution, I would also cast doubt on #1, partly because the Vasconic substrate area seems to include strongly many parts of Italy like Sardinia, in principle unaffected by the Magdalenian expansion, and I would also include at least to some extent parts of the Balcans (for example the Ibar river in Kosovo). Southern or Western Vasconic (Impressed-Cardium Pottery and related cultures, including the Megalithic urheimat in Portugal). Northern or Eastern Vasconic (Red-White Painted Ware in the Balcans and later Linear Pottery in Central Europe). Basque, ancient Sardinian, Iberian and the hypothetical lingua franca associated to Megalithism would belong to Southern Vasconic. Danubian Neolithic peoples would have spoken Northern Vasconic instead but, as we can see, they were eventually all but wiped out by secondary arrivals from West and East. Even the very Balcanic core areas of Thessaly, Macedonia and Serbia also suffered an invasion early on by peoples with Beige-Black pottery (Vinca-Dimini) surely related to Tell Halaf. So the main survivor to the Metal Ages was Southern (Western) Vasconic, which was then wiped out (excepted Basque) by the Indoeuropean invasions of Celtic and Italic peoples. We can still see fossils however. One of my favorite examples is the Latin particle bi- (as in bilateral, bilingual, etc. ), which seems derived from Vasconic bi (two, at least in modern Basque) and unrelated to PIE *dwos. Also the English words kill and ill, which seem related to Basque verb hil(-du) (pronounced /hill/ or /ill/ and meaning to die or to kill, depending on how you conjugate it). Again both English terms do not have any apparent PIE origins, although they may derive from proto-Germanic. These are just examples, of course, there seems to be much more to be researched. Appendix: detail of the data and bibliography: LINK. A new study has located some mitochondrial lineages that seem to be specific of Basques and nearby populations. The European genetic landscape has been shaped by several human migrations occurred since Paleolithic times. The accumulation of archaeological records and the concordance of different lines of genetic evidence during the last two decades have triggered an interesting debate concerning the role of ancient settlers from the Franco-Cantabrian region in the postglacial resettlement of Europe. Among the Franco-Cantabrian populations, Basques are regarded as one of the oldest and more intriguing human groups of Europe. Recent data on complete mitochondrial DNA genomes focused on macrohaplogroup R0 revealed that Basques harbor some autochthonous lineages, suggesting a genetic continuity since pre-Neolithic times. However, excluding haplogroup H, the most representative lineage of macrohaplogroup R0, the majority of maternal lineages of this area remains virtually unexplored, so that further refinement of the mtDNA phylogeny based on analyses at the highest level of resolution is crucial for a better understanding of the European prehistory. We thus explored the maternal ancestry of 548 autochthonous individuals from various Franco-Cantabrian populations and sequenced 76 mitogenomes of the most representative lineages. Interestingly, we identified three mtDNA haplogroups, U5b1f, J1c5c1 and V22, that proved to be representative of Franco-Cantabria, notably of the Basque population. The seclusion and diversity of these female genetic lineages support a local origin in the Franco-Cantabrian area during the Mesolithic of southwestern Europe, ~10,000 years before present (YBP), with signals of expansions at ~3,500 YBP. These findings provide robust evidence of a partial genetic continuity between contemporary autochthonous populations from the Franco-Cantabrian region, specifically the Basques, and Paleolithic/Mesolithic hunter-gatherer groups. Furthermore, our results raise the current proportion (≈15%) of the Franco-Cantabrian maternal gene pool with a putative pre-Neolithic origin to ≈35%, further supporting the notion of a predominant Paleolithic genetic substrate in extant European populations. I’d say that the finding of these three lineages is in itself the interesting part. The molecular-clock-o-logical speculations are something that as, you know, I tend to ignore. However these seem to be almost invariably just fractions of the realistic dates when properly calibrating, so if the authors get a 10 Ka date, then we can be reasonably sure that it is a minimum date and that the likely actual date can well be twice that figure (although in the case of mtDNA this may depend on each particular branch, as these are very unequal). Another important note is that the authors rather studied the sub-Pyrenean isthmic region rather than the original Franco-Cantabrian region, which corresponds mostly to what is now Southern France. I am always rather skeptic about attributing to Basques exclusively the legacy of this wider Paleolithic region and I want to insist that Southern France’s peoples (Gascons, Occitans, Perigordians and all others south of the Nantes-Lyon line) be studied in depth and detail along Basques, Cantabrians and Asturians. At the very least this study has an important Gascon sample (Bearn, Bigorre and Chalosse), although it is from the areas closest to the Basque Country. In a previous study by the same team (2011), they detected apparent Basque (or is it Gascon?) centrality of lineages J1c and U5b. In this study they refine those findings by locating some sublineages that are more clearly Basque-specific: J1c5c1 and U5b1f. They also spotted another Basque-centric haplogroup within V: V22. Figure 1. 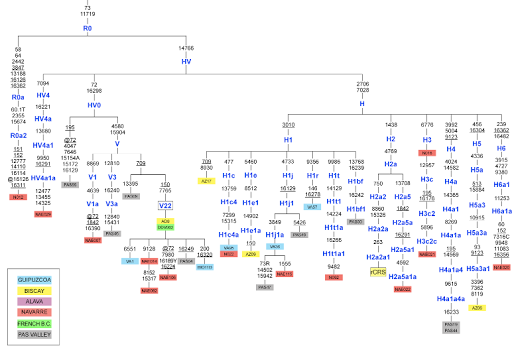 Maximum parsimony trees of haplogroups U5b, J1c and V including the three autochthonous lineages U5b1f, J1c5c1 and V22. transitions unless a suffix specifies a transversion (A, C, G, T). heteroplasmies were not considered for the phylogenetic reconstruction. U51bf in populations outside the Franco Cantabrian area (see Tables S2 and S3). French B.C. refers to samples from the French Basque Country. Not detected in: West Biscay (Enkarterriak), Pas Valley, Cantabria, (North?) Aragon, Madrid, Perigord-Limousin. So this U5b1f lineage seems concentrated around the Western Pyrenees with a highest density axis between, say, Baiona (Bayonne) and Zangoza (Sangüesa). It is a most important lineage in that core Eastern Basque and Southern Gascon area with frequencies above 5% and reaching almost to 25% in some cases. While we can appreciate the clinal decline in Iberia, lack of data for Gascony and most of the Paleolithic Franco-Cantabrian region (i.e. Southern France) leaves us without similar data for the northern cline, knowing only that in Perigord-Limousin is 0%. This last detail may explain why the haplogroup is contained within the wider Basque area, as Perigord (and not the Basque Country) was the true center of the Franco-Cantabrian region, a district I have dubbed sometimes “the metropolis of Paleolithic Europe”. Rather than looking for signals of expansion from the Basque Country only, researchers should look for such signals of expansion from Perigord particularly (as well as the whole Franco-Cantabrian region, from Provence to Asturias and from the Loire to the Pyrenees). Not detected in: SW Gipuzkoa, West Biscay (Enkarterriak), Bigorre, La Rioja, Burgos, Catalonia, Pas Valley, Cantabria, (North?) Aragon, Madrid, Perigord-Limousin. Again the lineage, even if much less common, is concentrated around the Western Pyrenees, with a highest density axis from say, Leitza to Maule, spilling to Chalosse and Bearn by the NE but again reaching zero frequencies at Perigord-Limousin (and not knowing how it behaves in between). In Iberia, outside of the Basque Country, is only found in the city of Zaragoza. As happens with U5b1f, J1c5c1 quickly declines towards the West in the Southern Basque Country, what may be ground, especially if other lineages also follow this pattern, to consider two original Basque populations: one around the Western Pyrenees and another one around Biscay. This idea, while not commonly formulated, would not be new at all, for example F. Krutwig already suggested in the mid 20th century that Central-Eastern Basques had a Dinaric-like morphology (pseudo-Dinaric, because “true Dinarics” are supposed to be brachicephalic while Basques are usually mesocephalic, like most Europeans), while Biscayans would be rather dominated by the rare Dalic anthropometric type instead. Debatable, of course, but that’s what we are here for, aren’t we? Not detected in Araba’s single-person sample: 0/1. I wouldn’t dare to reach any strong conclusions with such small and irregular sample but it does look like the Northern Basque Country and Gipuzkoa have the highest frequencies, what suggests that maybe the lineage extends to the North into Gascony, etc. Unlike the previously discussed lineages in this case the decline towards the West is not as sharp. The rock art of Askondo cave (Mañaria, Biscay, Basque Country) has been dated to c. 25,000 years ago. The materials used for the artworks (red paint and engraving) cannot be dated directly but a bone fragment encrusted in the wall provided an age of c. 23,800 years BP (C14–AMS) belonging therefore to the Gravettian period. The cave of Askondo (← aitz-ondo = near the rock) was believed to be a destroyed site but recent archaeological research has shown the opposite: that there is a lot to be researched in that cave, which has a surprising sedimentary depth of at least 6 m and that has already become, thanks to its artwork, in the third more important Paleolithic site of Biscay, after Santimamiñe and Arenaza caves. 8th. Congress on the Antiquity of the Basque Language. “Mythology: A Science for Analyzing the Past”. Juan Inazio Hartsuaga: Fossil Words. Roslyn M. Frank: Looking for attributes and cognitive tracks in the figure of fourteen, within and out from Euskal Herria. Felix Zubiaga: Dramatic performance of a Sumerian-Basque tale. Xabier Renteria: Basques of older times: Mythological vision of the world and pre-Indo-European Basque language. Antonio Laguardia: Iberian writings and the hieroglyphs from the 8th to the 29th Century B.C. There are other bilingual articles in the Jatorriberri newsletter. Trebiño (also Treviño in Spanish), just south of Vitoria-Gasteiz, Western Basque Country, includes de the sierra of Araiko, which was, we get to know now, in the Upper Paleolithic one of the main sources of flint stone of SW Europe, “exporting” to most of the Franco-Cantabrian Region, the core of Late UP Europe. The quarry left rather massive remains, hard to discern today, as they have been reclaimed by Nature again, such as 300m long ditches and rubble piles seven meters tall. Mining tools have also been found. The high quality Trebiñese flint stone was used by most Upper Paleolithic peoples in the region, underlining the notion of extense socio-economic networks already in those times, and the site continued in exploitation through the Neolithic and Chalcolithic eras. 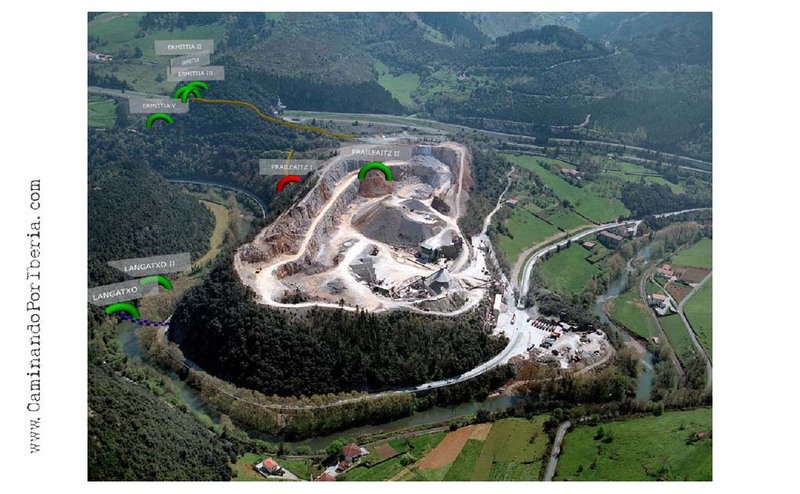 The archaeological site is in danger because of the planned erection of a wind energy generation park right atop of it. Update: the wind park planned on it was actually suspended on October 2012, it seems. Source: Diario de Burgos[es] (via Pileta[es]).